Do you know about that coffee? One morning there was no coffee in the kitchen. I walked around my house to find some coffee. Then, I found some coffee packages. 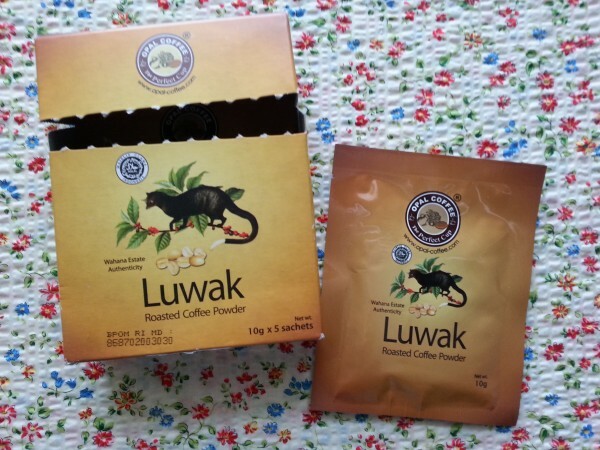 They were “Luwak Coffee” which I bought in Indonesia. Luwak Coffee is made from civet’s poop! Luwak is Indonesian and it means an animal and looks like a cat. Luwak Coffee is made from civet’s poop!! As it has a peculiar aroma and is scarce, it is highly priced. If you have a cup of civet coffee at a cafe, it costs a few thousand yen. Civet’s aroma is also used for a famous perfume, CHANEL No.5. I drunk a cup of the coffee. The taste was sour and not sweet, with a combination of other kinds of flavor that I can not describe. I like the aroma and it’s good taste. The aroma and taste of the Luwak coffee woke me up and refreshed me in that morning.